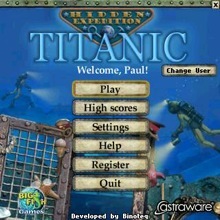 Coming nearly a decade after the hoopla surrounding James Cameraon’s 1997 film that renewed interest in all things Titanic, Hidden Expedition: Titanic is a new release for Palm OS and Windows Mobile devices from publisher Astraware and developer Binoteq. For a basic overview of the history of this game as well as a summary of its lineage (a port from a best-selling PC casual gaming title), please see Astraware’s overview. 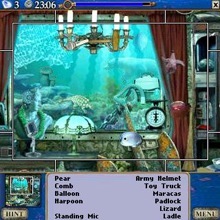 The Palm OS version is licensed from original PC publisher Big Fish Games and is quite a faithful port from its beefier Windows PC predecessor. Unfortunately, this is likely the root of the major problems with this title. First and foremost, the game has two major problems: bland hunt’n click gameplay devoid of any real interaction and tiny graphics maddeningly unsuited for the limited Palm OS screens. Playing the game on my Treo resulted in a headache after about 30 to 40 minutes of gameplay. Things fared a bit better on my TX both due to the physically larger LCD and the extra resolution, but it still left something to be desired. I would not want to even imagine what the game would be like on the Centro’s tiny screen. For anyone over the age of 30ish or with less than perfect vision I would imagine game to be simply unplayable. These shortcomings are absolutely devastating to whatever enjoyable elements might be otherwise present in the game. On top of the tiny item sprites already mentioned, there is a bit of wasted screen real estate taken up by the list item list as well as a minimap of the screen. I found the most effective control mechanism to be scrolling around the screen with the d-pad while tapping for items with the stylus in my other hand. When using the d-pad for navigation, it would be helpful to have an option to remove the onscreen scroll bars, as I found them to be rather distracting. Only after several hours of continued playing was I finally able to complete the first two areas (the ship’s deck and the dining room) twice in succession and then the bonus puzzle round before proceeding to unlock additional rooms on the ship. 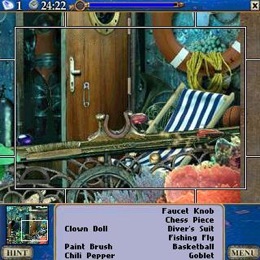 The bonus round offered up a twist on the standard gameplay by replacing the textual descriptions of a half-dozen objects and instead presenting a list of black outlines of the items that must be found. I actually found this a slightly more enjoyable twist on the standard gameplay but this change only heightened the difficulty of the game. At the conclusion of these first 3 levels, I was so frustrated that I no longer cared about seeing the rest of the ship. On a lesser note, I found some of the contents of the rooms (a basketball? A heart? A TOY ROBOT? A JET PLANE?) to be silly and inappropriate to the historical theme of the game. A stunning oversight, in my opinion, is the game’s lack of an adjustable difficulty level. The first stage, on the deck, could be devoid of the ever-dwindling oxygen gauge and “unlimited” hints could be granted to the player. I also feel that the designers should have employed fewer, larger objects to be found in the first few stages and gradually ramped up the difficulty level as the player progresses into the bowels of the ship. Another issue compounding the difficulty of the game is that most levels are impossible to complete without resorting to at least one or two taps of the hint button. Unfortunately, using this aid gobbles up huge amounts of oxygen and while using a flurry of hints might permit the completion of the current room, will only handicap the player upon attempting to solve the next room’s puzzles. Incorrect taps also deplete the player’s oxygen supply at an alarming rate. An option to have the oxygen level replenished upon entering each new room would have been a no-brainer and shows the lack of thought put into the game’s development. This game’s difficulty level is simply cruel and reeks of poor design, lacking the fun challenge of earlier Astraware classics such as Bejeweled or Zuma. With the diminishing revenues from the Palm OS software market a constant concern of developers, one would think that Astraware would have the foresight to craft a game where the difficulty could be adjusted to fit players of all ages and skill levels. Quite simply, Hidden Expedition is a graphical tour de force for the aging Palm OS. The colors are rich and vibrant and, despite the unrealistic objects contained in the various rooms of the ship, they help convey a sense of believability. Unfortunately the combination of the ticking clock and an ever-dwindling air gauge prevent players from spending any time enjoying the graphics. The issue of the ultra-small object graphics has already been discussed. The in-game storyline elements, ship factoids, and in-game tips are advanced through a series of text scrolls that also fail to utilize the full size of the screen and employ small text. Astraware remains one of the few companies to consistently employ full background music on their Palm OS games and they continue this trend to great effect here. The looping title score is a standard-fare, 16-bit console era song that nonetheless sounds suitably haunting and is varied enough to not detract from the gameplay. I noticed no issues whatsoever running the original 1.0 version of the game from an SD card on both my 1.10 ROM 700p and my TX. The game plays nicely with the rearranged hard button remappings on newer Palm devices. There’s also a helpful onscreen icon for exiting the game. The game’s brightness controls can also thoughtfully be adjusted in the options menu but no other choices affecting gameplay can be altered. While some users may complain about the memory space requirements of the game, I personally much prefer having everything packed into a single PRC instead of a myriad of PRC & PDB files scattered throughout my device like many older titles. Also, in this day of extremely affordable multi-gigabyte expansion cards, storage woes are mostly a thing of the past. Rock solid stability and the usual Astraware support. Upon initial inspection, Hidden Expedition: Titanic appears to have all the hallmarks of a landmark Palm OS title. However, the sheen of the game’s graphic and aural excellence quickly wears off and is replaced by frustration and and aggravation ensuing from the squint-inducing gameplay. Even if played on a large, high resolution display, the actual “game” remaining beneath t he visual splendor is sadly reminiscent of early 1990s PC CD-ROM shovelware (but without the FMV fluff). To put it simply, this kind of game, even on a large-screened T5 or TX, is ill-suited to the Palm OS and its hardware constraints. . I could see Hidden Expedition making for a mildly amusing title to play on a PC with a fullsize monitor. I could even see it making a nice Shockwave or Flash-based online title or even as a minigame within a full-size game (the great little pipe game within the smash hit Bioshock is a perfect example). But as a stand-alone title, Hidden Expedition:Titanic ultimately ends up offering far more frustration than entertainment. Astraware has a sterling track record of producing solid Palm OS titles and I would hate to see them tarnish this reputation with shoddy ports such as this one. Hidden Expedition: Titanic for Palm OS is available now for $19.95 USD. A limited-play demo version is available. For Palm OS devices it is available as a single PRC file of 5.86mb in size and requires at least a 320x320 display. The game is also available for Windows Mobile Smartphone/Standard and Windows Mobile/Pocket PC devices and Windows desktops as well. Due to heap memory limitations, Astraware advises that this title will not run on the Tungsten T, T2, E, E2, Zire 71 or Garmin iQue 3600. It is also incompatible with all 160x160 Palm OS devices. In short, the only Palm handheld currently in production capable of running this game is the Palm TX. Granted, I've been playing Titanic on my T3, so I have the "higher" resolution on a larger screen, though honestly the play was identical with the slider closed (so "higher" resolution is non-issue). Don't miss the POINT of the game when you do a review. That's like saying the Lincoln Towncar is a horrible car because it doesn't race around the track like a Porsche Boxter. They're both good cars, but have very different purposes.